Perennial. Zone 3. Montiaceae – Montia Family – formerly Portulacaceae. Native to western North America, east of the Cascades in southern British Columbia, south to California and east to Montana, Colorado and Arizona.This plant is the state flower of Montana. Also known as ROCK-ROSE and RESURRECTION FLOWER. 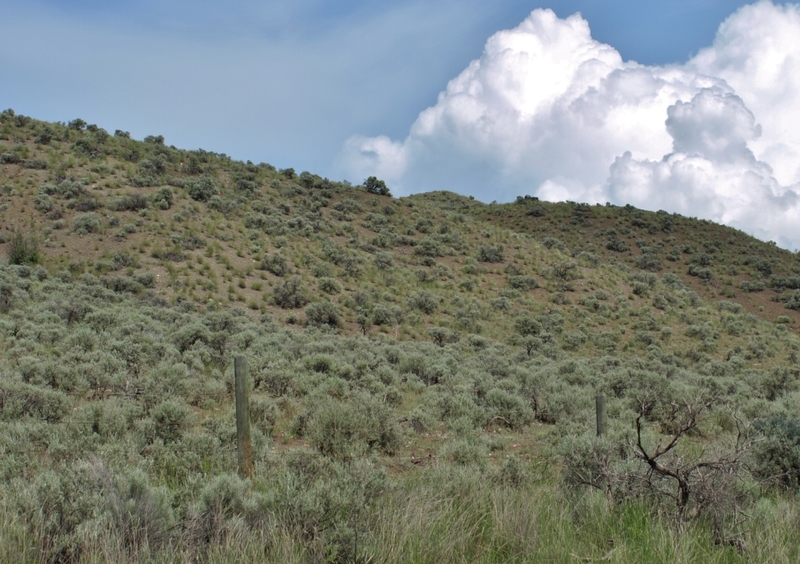 This improbable ephemeral of the sagebrush hillsides of southern British Columbia (from approximately Cache Creek, south and eastwards) is of remarkable delicacy, rather unexpected considering its challenging home. Tiny rosettes of succulent foliage emerge in early autumn, taking advantage of fall rains to fatten them enough for overwintering. In spring, the foliage withers away, and, as the leaves die, elongated flower buds emerge on short stems in April and early May, and proceed to unfold tissue-thin, delicately veined petals in shades of white to rich rose-pink. 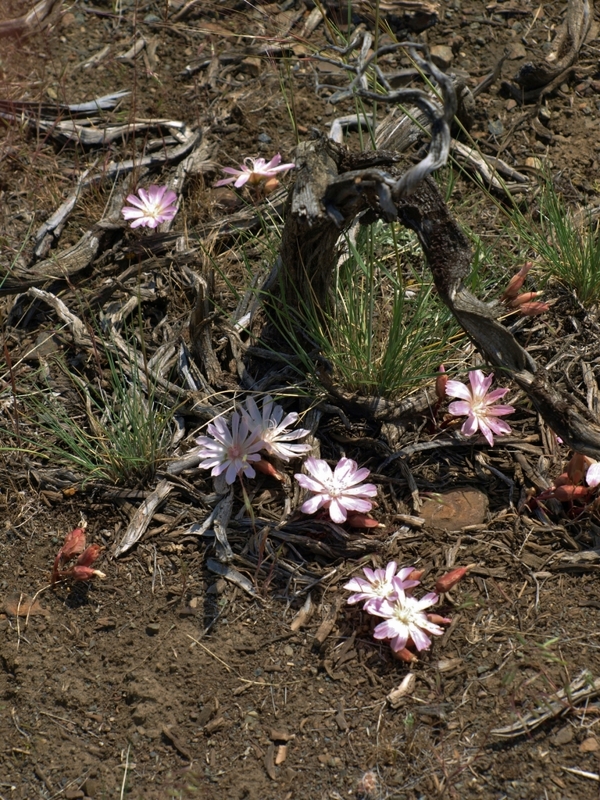 Lewisia rediviva was an important food plant for the region’s First Nations people, though European settlers who sampled the roots reported that its bitterness was not to their liking. Here is an excerpt of this plant’s entry in Lewis J. Clark’s 1972 masterwork, Wild Flowers of the Pacific Northwest. 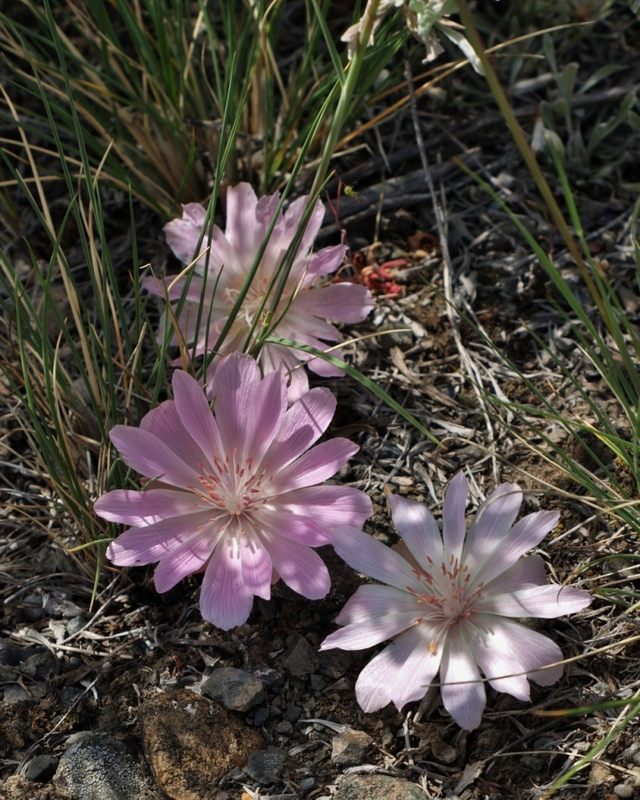 This extraordinary plant, remarkable for its spectacular flowers and adaptation to a harsh environment, is the state flower of Montana, and gives its name to the Bitter Root Mountains. The origin of the specific name is illustrated by an anecdote. Captain Meriwether Lewis, on July 1, 1806, when the celebrated expedition he led with William Clark had reached (on their return from Oregon) a point just south of the present city of Missoula, Montana, collected a specimen of what he recognized to be a remarkable plant, and pressed it between dry papers in a botanical press. Months afterward (in Philadelphia) this completely desiccated specimen was planted, since it still showed signs of life – and proceeded to grow! Pursh was so impressed that he aptly named the new species rediviva, restored to life. We would like to see the Indian name retained, just as we have seen that the native name has survived for Camas, and has even been Latinized as Camassia. Spatlum, or Spaetlum, was even more important as a food resource to the aborigines, being more widespread and more readily kept for winter use. Bitter Root is, of course, the white man’s name – for even after removal of the intensely bitter, orange-coloured, inner bark, the white interior pulp remains rather unpalatable to the European taste. Lewisia rediviva occurs – at times in vast numbers – both among the rock spurs of the high country, and the desert flats of the inter-mountain regions, from the crests of the Cascades eastward, and from southern British Columbia to southern California. The relatively big, forked, fat rhizomes of the plant, after the first rains of waning summer, sprout a thick tuft of succulent leaves that resemble large plump fir-needles. These leaves survive the winter but begin to shrivel, and are often quite withered away by the following May, when the arid wastes are sprinkled – it seems almost overnight, miraculously – with brilliant “water-lily” blossoms – white, pink, and rose. These open only in bright sunshine, and afford a quite astounding spectacle. On dull days the spectacular waxen petals become furled, like an umbrella, within the brownish bracts and sepals, only to reappear within minutes – as if by magic – when the hot sun breaks through. The effect is breath-taking on some of the dry flats, where the plants adorn every few inches over many acres. Each 2-inch flower (with its 12-18 petals) is solitary, carried about 3 inches above the ground, and ripens 6-20 shining brown seeds (that are spread widely when the dried capsule is broken off and rolled away by the wind). 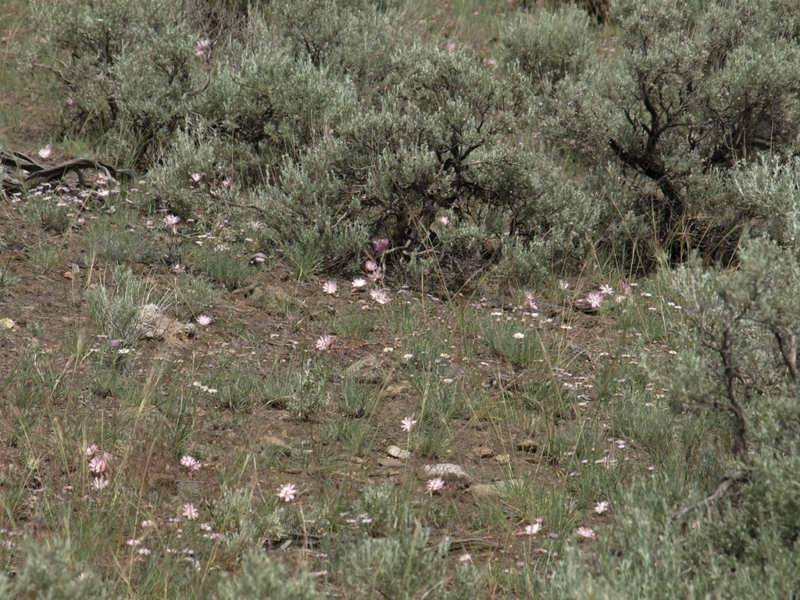 In spite of the destruction of many fields by cultivation, the lovely Bitter Root still is abundant in arid flats unsuited for irrigation. 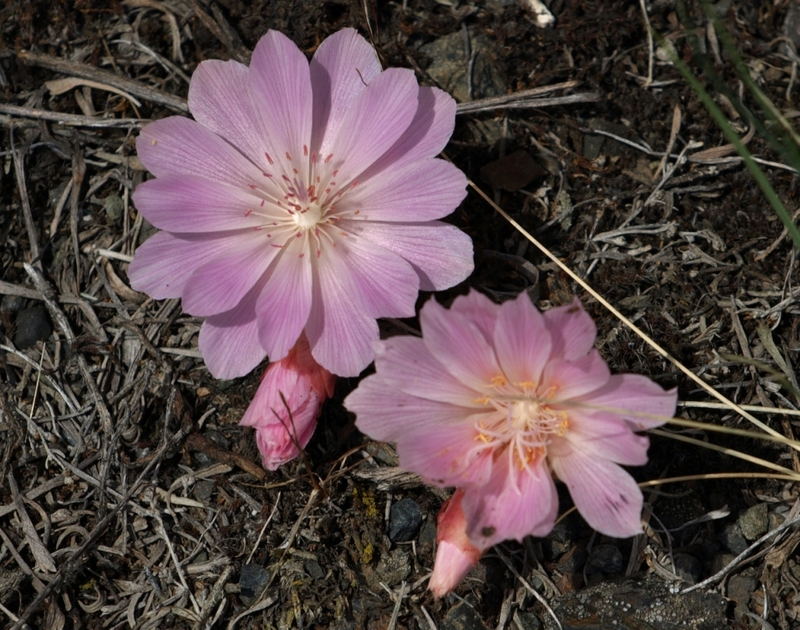 On a 2014 journey through south-central British Columbia, we were thrilled to observe Lewisia rediviva in full bloom along the roadside near Ashcroft, B.C. A casual driver-by might miss this botanical spectacular, but a sharp-eyed plant person will have no difficulty in noticing something worthy of further investigation. Start searching on the west side of Highway 97, just south of the racetrack. Late April to mid-May is the time. Plants should not be taken from the wild, but can be grown from collected or commercially-purchased seed. Seeds should be sown in pots in autumn, and placed outside to overwinter in a freeze-thaw cycle. They will sprout when the weather warms in spring, and generally take several years to reach flowering stage. Lewisia rediviva is only happy in a well-drained location with zero supplemental watering in summer – too much moisture will be fatal. Tiny foliage tufts overwinter under the snow, to give way to the spring blooms. Not for the garden proper, but a lovely rock garden plant, and worth trying in a hypertufa trough, if such is your horticultural pleasure.